Protein isn’t the most important aspect of your nutrition, but it is vital for good health — especially if you’re wanting to tone your muscles. If you’ve gone to fitness class after fitness class and you’re ready to see some real difference in your body, start by evaluating your diet. We’re not saying you need to go on a diet; just practice mindful eating and make sure your body is getting the nutrients it needs. At Barre Rhythm in Eagle, we offer fitness classes that improve your strength, flexibility, and balance. If you combine our workout classes with good foods full of protein and other nutrients, then you’ll achieve the lean, toned body you want. 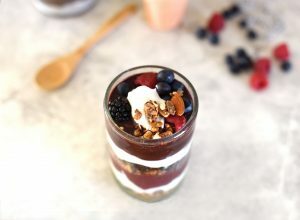 When you want the most out of your Pilates classes, barre workouts, or yoga classes, you need to start the day out right with a filling breakfast full of protein. Make a yogurt parfait with berries, chopped walnuts, and 2% yogurt. You can top it with cinnamon, honey, or other spices you love, and you’ll have more than 20 grams of protein in a tasty, on-the-go meal. Did someone say breakfast burritos? Wrap up eggs, cheese, avocado, beans, chorizo, and salsa in a wheat tortilla, top with some cilantro or avocado, and eat up! 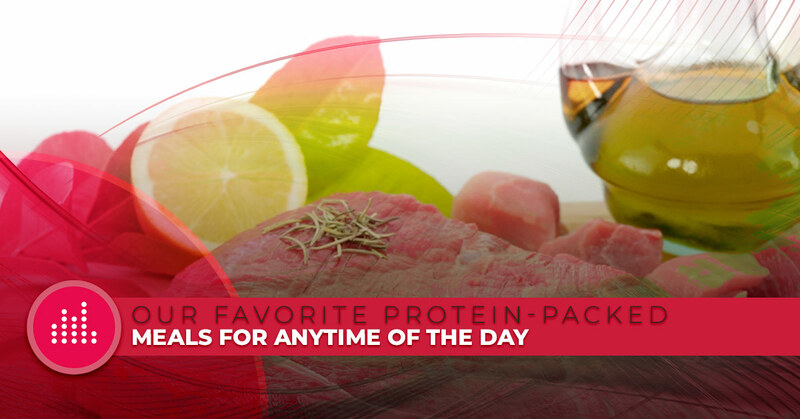 You’re getting more than 20 grams of protein and it couldn’t taste better. There are also lots of protein-packed meals you can prepare ahead of time to simplify your morning routine before your workout class. Say goodbye to sad lunches at your desk and say hello to your tasty, mid-day meal that will up your protein intake. Load up kale, chickpeas, and quinoa — with any other seasonings you’d like — in a bowl and top it off with tahini for a protein-packed meal that will make your coworkers jealous. No need to say goodbye to sandwiches altogether! Add some protein, and your favorite sandwich is here to stay. Turn a tuna sandwich into a vessel by which to eat protein when you combine tuna, salmon, plain Greek Yogurt and other spices and vegetables on whole-grain bread. By loading up on lunches full of protein, you’ll have plenty of energy for your afternoon group fitness class. 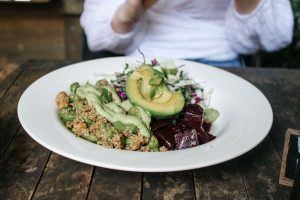 Replenish your body at the end of the day and give it plenty of protein you can use to get toned muscles during your next Pilates workout, yoga class, or barre workout. Take your favorite pasta to the next level when you top it with a poached egg. Whole wheat penne, tomatoes, spinach, nutritional yeast, and a poached egg will make your pasta both tasty and full of protein, especially once you add paprika, fresh basil, and grated parmesan. Taco bout a good dinner! Make shrimp tacos with mango, basil, corn, and feta on small corn tortillas, and you have a summery meal that can’t be beat — especially since there are more than 30 grams of protein in one serving. Need other high-protein dinner ideas? Here at Barre Rhythm in Eagle Valley, we’re eager to help you live your best, healthiest life. That doesn’t just come down to how often you attend our group fitness classes. Nutrition is a huge factor in it, and we hope this blog post helps! When you fill your diet with healthy protein, you can rest assured that your efforts during your workout classes won’t be wasted. Sign up for a class today!